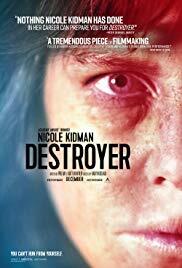 Obviously, the most striking element of this film is the transformation of Nicole Kidman. Her weathered, unkempt appearance with black-rimmed eyes, smudged skin, and a tousled haircut indicate an unhealthy lifestyle and a stubborn addiction. It soon becomes clear that the bottle has become her closest friend. Normally Nicole Kidman looks so snappy and flashy in other films. Here she’s shabby and unrecognizable. The past took a heavy toll on her during an undercover operation where her partner Chris (Sebastian Stan) drew the short straw. Erin Bell (Nicole Kidman) has since lived in a daze. Probably an attempt to erase the past and to alleviate the pain in her ruined life. I’m not a fan of flashbacks. The film is a circular story, peppered with a lot of flashbacks. I myself am not a fan of films that jump back and forth on the timeline, but in this case, I thought it was skilfully put together. So when at the start of the film Erin Bell wakes up from her alcoholic intoxication and appears at a crime scene, this is the moment when she realizes that something from the past is back on her track. And the unknown dead guy lying there with an ink-stained dollar bill is the start of a long search for Silas (Toby Kebbell), the cause of all her troubles. And that search will show destruction, corruption, and desolate living conditions. Something that fits Erin Bell wonderfully. It’s payback time and nothing can stop Erin Bell to do just that. Kidman still has that glamorous appearance. Despite the pitiful appearance and the excellent make-up used on Nicole Kidman, the image of a handsome and glamorous film diva, as she is, still remained on my retina. No matter how hard she tried and the way she worked herself into the role of the rebellious and cursing detective who consumes her portion of alcohol every day. It just didn’t work out for me. Maybe not really fair to Nicole Kidman. But it feels the same as Jim Carrey playing a serious, dramatic role or Arnold Schwarzenegger doing a comedy. Well, guess she can’t get rid of that image. Being biased is a strange thing. All credit to Kidman for making a bold choice to leave her comfort zone and take on such a daring role. Silas is a fascinating character. Unfortunately, the Nicole Kidman stunt is also the only thing that made an impression (even though I mainly read negative criticism about it) because for the rest it’s just a disappointing and scanty story. The main part deals with the undercover operation where Erin and Chris infiltrate the Silas gang. On the one hand, Silas is a fascinating character. A cruel, sadistic person who’s unapproachable and manipulative. A fearless leader who cannot tolerate contradiction and punishes misconduct without mercy. On the other hand, it’s not something we haven’t seen before. The other members aren’t particularly interesting and only serve to help Erin with her search. The only noteworthy thing is Jade Pettyjohn as the rebellious teenage daughter Shelby. However, her contribution is too limited to form an opinion. A crafty piece of work but mediocre at the same time. Even though they tried to be inventive when it comes to the timeline. And even if the film had some beautiful scenes. And the footage of the bank robbery, where Erin unconsciously winded up in, was unparalleled (the most action-packed scene of this film). I still missed sharpness. It wasn’t edgy. It all felt too easy. It wasn’t more than a story about police work, corruption and taking revenge. I don’t dispute the fact that the story is technically a crafty piece of work. But in general, it wasn’t really impressive. Kidman’s make-up caused bewilderment. Once the shock effect was over, it felt more like a gimmick.